Encapsulated inside this block of acrylic is a tri-angular piece of white card measuring 1.4 inches wide at the base and .75 inches high. This is a piece of the rear cover of a checklist flown to Lunar Orbit during the Apollo 12 mission to the moon in November 1969. 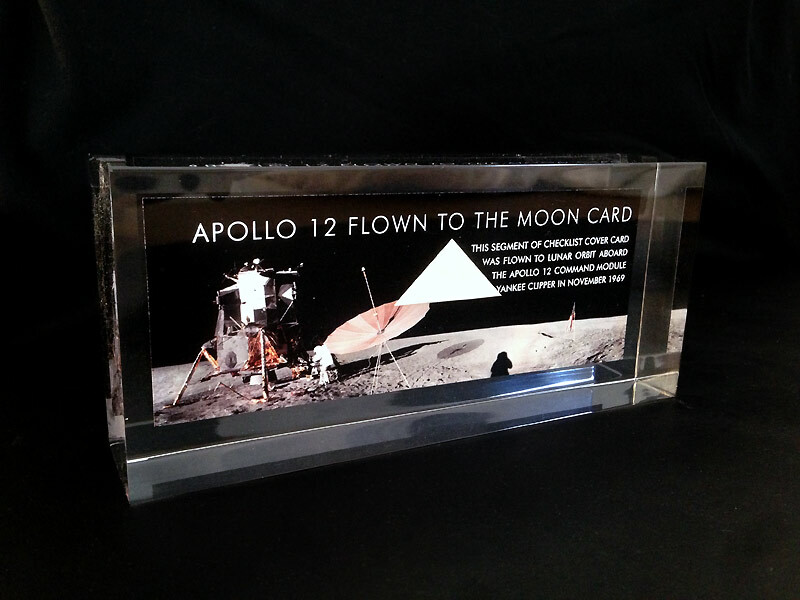 The card floats in front of a mini Apollo 12 Moonpan depicting Pete Conrad on the Lunar Surface beside the Lunar Module, Intrepid and the large S-Band Antenna. Limited edition of only 140 Acrylics. Each comes with a numbered Moonpans COA. The overall size of the block is 7 inches wide x 3 inches high x 1.5 inch thick.